Automatically Integrates with STEAM . Built Specifically for Gamers by Gamers. Easily Enable for Any Game Quickly. Makes Games Load and Play FAST! Your STEAM games will automatically load into DimmDrive, making them quick and easy to enable for lightning fast loading and game play. Drag any application or game shortcut and drop it into DimmDrive and that’s it. You can use ANY programs too including Adobe Photoshop, Illustrator, and any game! DimmDrive places your game files in RAM, drastically decreasing your in-game loading times and reducing lag. You can customize how much RAM you want to use, which game or program files you want loaded into RAM, and much more! Everytime your game needs new assets (moving to a new level, increasing view distance, etc.) they load slowly from the Hard Drive into the RAM, then uses the data and discards it when it is no longer needed. When you save games they are stored directly to the HDD, generating more wait times. DimmDrive creates a virtual drive and preloads all game assets into RAM. Whenever your game needs files, they are quickly loaded from the RAM drive, reducing and even eliminating load times. The data is never discarded, allowing the game to reuse it instead of loading it again. Savegames are instantly stored in the RAM drive, which then synchronizes them to the HDD without affecting your game play and protecting you from data loss in case of an unexpected shutdown. DimmDrive is the only RAM disk software built specifically for gaming. Integrated with Steam, the biggest PC gaming community plaform, DimmDrive includes custom configurations and syncs your savegames to your hard drive and Steam Cloud as well. While other programs restrict the complete use of RAM to their own brand modules, DimmDrive can allocate the maximum quantity recognized for your OS, up to 256GB in Windows 8 Enterprise and Professional. Additionally, if your PC contains a relatively slow hard drive, you can further boost system performance using DimmDrive's USB3 Turbo Mode. Guaranteed to Speed Up Your Gaming or Your Money Back! We’re so confident DimmDrive will dramatically increase the loading and speed of your games that we offer a full 60-Day Money Back Guarantee. If for any reason within 60 days if you’re unsatisifed for any reason please contact us for a complete no-questions-asked refund. What are the requirements to run DimmDrive? A 64bit PC running Windows 7 or above, with any CPU, with at least more RAM than your OS+programs use. DimmDrive can use any amount of RAM, from 256MB to 256GB. Is DimmDrive a one-time fee, or is there any yearly/monthly subscriptions? DimmDrive is a single purchase. No renewals, new hidden fees, no nothing. Buy it once and enjoy all the benefits of the continual updates we are releasing. Do you support Windows XP or Apple Products? Heck no! DimmDrive was built blazingly efficient, and as such, we only support up to date 64bit Windows 7, Windows 8, and Windows 10! How fast exactly does DimmDrive's RAM drive operate at? This varies based on your system. 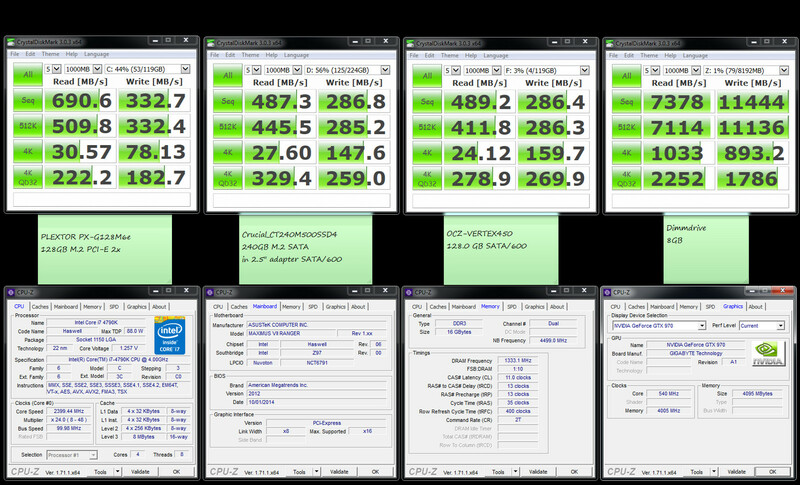 We've tested on 4 systems with $1k systems benching more than 7000MB/s, to $4k+ systems reaching 11,000MB/s. Further, we've had reports from users able to hit 14000MB/s! My personal gaming rig sits right around 8500MB/s to 9000MB/s. I highly encourage you check our Forums to see what customers are benching at! Can I use DimmDrive if I don't use Steam? Of course! You can either click/drag programs into the “APPS” area of DimmDrive, or drag a folder there, or simply bypass DimmDrive's built-in system and launch an empty RAMdrive by simply selected the size and clicking ON! How much RAM do I need for DimmDrive? The more RAM you have, the better. It really boils down to what you are using it for. Also, DimmDrive has a feature we call “Less RAM?” which enables you to selectively pick which files in a game you want to go blazing fast. This feature alone can take a 10GB game and slim it down to 4GB-ish by removing video/intro files, sound files, and other non-essential files that do not need to go blazing fast. If you are doing light gaming, we recommend having 6GB+ RAM. If you are doing heavy gaming, we recommend 8-16GB. If you are using DimmDrive for things like Audio/Visual scratch disk, you typically will want 2GB or more for that. As with everything PC related, the more RAM, the better! Have more questions? Visit our Forums.